In the NHL, legacies are determined by championships. Elite talents are expected to lead their respective teams to glory at some point in their career to be considered legendary. Two names that stick out are Canadian golden boy Sidney Crosby and Russian scoring machine Alexander Ovechkin. Drafted one year apart, both made their rookie debuts in the 2005-06 season. While it took time, they each captained at least one championship team. Crosby is currently a three-time Stanley Cup champion, with his Pittsburgh Penguins winning in 2009, 2016 and 2017. Ovechkin, meanwhile, led the Washington Capitals to their first ever Cup this year. Now, the pressure shifts to another talented goal-scorer and top draft pick in Tampa Bay Lightning captain Steven Stamkos. Another first overall pick in the league, Stamkos has yet to prove himself on the biggest stage. Can he do that by leading his Lightning to a Cup or will he forever be immortalized as a great player that couldn’t win it all? Unlike fellow top picks Crosby and Ovechkin, Stamkos’ rookie season was anything but smooth. It began with first-year head coach Barry Melrose publicly stating that he wasn’t ready for the NHL. That didn’t sit well with the Lightning’s former owners, Len Barrie and Oren Koules, who wasted no time getting rid of the longtime NHL analyst 16 games into the season. Once associate coach Rick Tocchet took over, Stamkos found himself watching games from the press box as a healthy scratch. That’s not an ideal situation for anyone, but 2008’s No. 1 draft selection took it in stride. In fact, his 46 points ranked third on the team behind veterans Martin St. Louis and Vincent Lecavalier. The following season, Stamkos broke out in a big way. His 51 goals tied Crosby for the league lead, earning him a share of the Rocket Richard Trophy. He also showed significant improvement defensively, going from a minus-13 his rookie year to a minus-two as a sophomore. There was still room for improvement though. Under new coach Guy Boucher, Stamkos took his game to a new level. His 91 points finished eight shy of the team lead held by St. Louis. More importantly, he finished with a plus-three rating, the first positive rating of his career. That helped the Lightning make the playoffs for the first time since 2006-07. 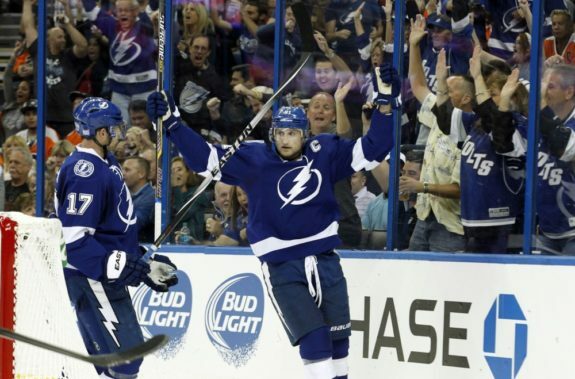 After experiencing his first postseason, Stamkos was hungry to get better than he already was. He accomplished that goal and more, scoring 60 times in 82 games. That earned him a second Rocket Richard Trophy and put him in rare company, with only 20 players accomplishing such a feat and one (Ovechkin) since 1995-96. Sadly, a lockout and numerous injuries cut short many of his prime years. When healthy, he often scored at a point per game pace and was deadly on the power play. There was no denying he could change a game, something fans of other teams saw on almost a nightly basis. The only question was could he stay on the ice long enough to cement his name into the list of all-time greats? For the number of regular season accolades accomplished throughout his career, Stamkos has been nothing more than a ghost come playoff time. Yes, he missed all but one game in 2016 due to a blood clot, but the numbers are underwhelming for a player of his caliber. While Crosby and Ovechkin have stepped up late in their teams’ championship runs, Stamkos has gone silent when the stakes are at their highest. Seven goals and a minus-one rating in 17 games is enough to elicit concern but the more alarming numbers are zero and minus-two. That’s what he combined to produce when the Lightning had a couple of chances to close out the Eastern Conference Final this past postseason. His only game of the 2016 playoffs after returning from blood clot surgery wasn’t entirely impressive, but he played. In that situation, it’s hard to judge a guy who’s missed nearly two months and is likely still trying to find a groove on the ice. The 2015 postseason was a bit of a rollercoaster ride for Stamkos. He struggled against the Detroit Red Wings in the first round, played fantastic hockey versus the Montreal Canadiens during Round 2 and did enough to push the Lightning past the New York Rangers in the Eastern Conference Final. Then came the Chicago Blackhawks in the Stanley Cup Final. On the biggest stage of his career, Stamkos went quiet. He was unnoticeable except for the few defensive miscues that ended up behind former goaltender Ben Bishop. Another thing that stands out is his goal-scoring totals in the playoffs. As one of the NHL’s elite snipers, people expect Stamkos to score whenever and wherever he wants. It’s not that easy of course, but no more than seven goals in every postseason appearance thus far is underwhelming, to say the least. No matter how much greatness Stamkos achieves during the regular season, his mark on the game won’t be felt until he hoists Lord Stanley’s Cup. That’s the reality when you’re a former first overall draft pick, entering the league with the amount of hype generally reserved for Hall of Fame candidates. 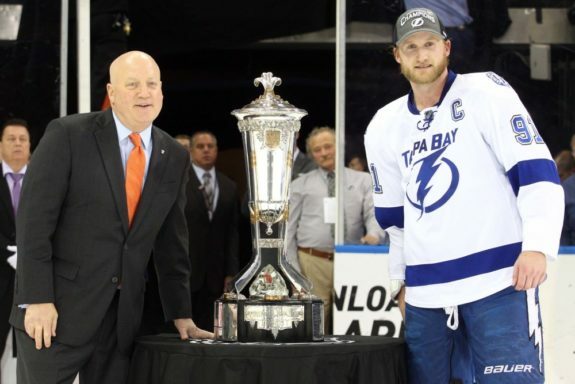 Stamkos has a long way to go before finding his way into that coveted discussion, but he can at least cement his legacy as a member of the Lightning by doing what his mentors in Martin St. Louis and Vincent Lecavalier did 14 years ago: capture the Cup. 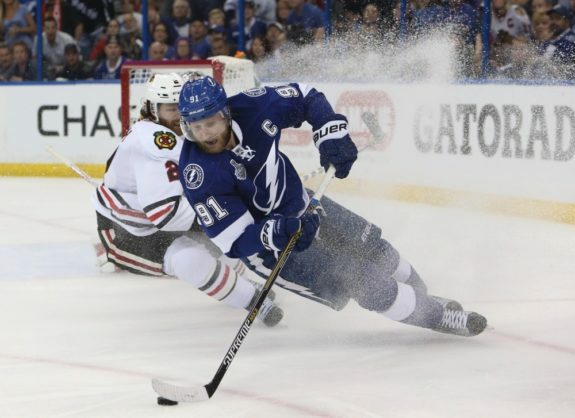 With both talent and a supporting cast, Stamkos has what it takes to be a champion. The only question now is, can he finally lead his team over the hump and back to glory? Unfair as it might seem, his legacy as a player depends on one thing – getting his name engraved into the Stanley Cup.